WASHINGTON -- China's development is crucial to the world economy and will help the developed economies and the world as a whole to stave off the possible recession, a leading US economist said in a recent interview with Xinhua. "China, certainly by far the world's economy main drive... is accounting (for) about 1 quarter of total global economic growth," said Fred Bergsten, director of the Peterson Institute for International Economics (Peterson Institute), a top US think tank. "I think China's own rapid growth will continue and that will provide a major impetus to the world's expansion that will help the US, west Europe and other slowly growing parts of the world drop out the recession," he said. Bergsten, who first visited China some 20 years ago, has been to the country about a dozen times and was deeply impressed by the progress China has achieved since its reform in 1978. "The progress I have seen in China by my own eyes was more dramatic than I've seen in many other countries in the world," said the economist, who served as an assistant secretary of the US Treasury during 1977-1981. He said many of his colleagues in the United States have erroneously viewed China as a closed economy setting lots of trade controls and blockages for foreign investment. However, he believed that China is the most open developing economy in the world, more open than many industrialized economy. "That is important because China chose consciously to integrate with world as a development strategy," Bergsten said. According to him, China joined such international organizations as the WTO partly to promote the country's internal reform, further its development as well as modernize its economy. "I think China's trade policy strategy toward global engagement is brilliant," said Bergsten. As the current financial crisis causes a sharp slowdown in the US economy and a severe decline in the world growth, China also feels the impact of the financial tsunami. "Many factories closed in China, many factories closed in the United States and everywhere, that's the process of market-based economy," said Bergsten. China is reducing its huge trade surplus and begins to rely more on its domestic demand, which the economist believed is a natural and desirable adjustment process for the country. He said that China was too dependent on growing trade surplus in the last few years, which was "unsustainable." As the world economy wrestles with financial turmoil, China also faces challenges in its export. And Bergsten predicted that "reaction against China will be intensified". 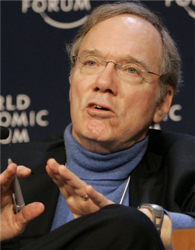 When asked about his opinion towards the current crisis, Bergsten responded quite optimistically. He said that although the current financial crisis is very serious, yet, it does not always lead to economic crisis. He believes that the US economy, at least for now, has avoided a recession, and the bailout plan proposed by the US government and passed by the congress will work. Bergsten was also very optimistic about the future of China. "I think China has enormous possibilities for continued rapid economic growth, and I expect another 30 years of very positive progress in reducing poverty, increasing living standards, continued rise of China," he said. Bergsten believes that the rise of China poses both challenges and opportunities to other countries. "China's rise is clearly a very good thing to the world, a good thing for the United States," which means the US is now dealing with a more developed, more sophisticated and more mature China. "China plays a major role in the world's economy," said the director of the Peterson Institute, "It's very hard for any country developed so rapidly to integrate into the global order, and also to realize its own responsibilities for helping to assure a stable, constructive and prosperous global economic system." Bergsten proposed a high level of cooperation between the United States and China. He believes the Sino-US relationship is the most important bilateral ties in the world. And it is crucial for both sides to resolve disputes in an effective and cooperative way whenever they arise, he said. "That's why I believe the US and China should put a mechanism in place including annual summits of our two governments," he told Xinhua, indicating the two countries should create a dispute-settlement framework. Bergsten, who was listed as "one of the 10 people who can change your life" by USA Today, predicted that the next US president would approach the country's relations with China probably like the last two presidents. He explained that both President Bill Clinton and President George W. Bush had talked about big changes in policies toward China before they were sworn in. But the reality was that both carried out policies largely contradictory from what they had said in their campaigns. That was because "the interest of the US and global position of China" are the larger factors to determine the two countries' relations, he noted.